Hello. I'm Aida Elhalwagy, Centre Director of Mathnasium of Georgetown ON, your neighbourhood math-only learning centre. We help kids in grades 1-12 understand math by teaching the way that makes sense to them. At Mathnasium of Georgetown, we help our community kids everyday learn math the way it makes sense to them. Whether they need to catch up or get ahead, we meet them where their skills are and take them where they need to go. We offer year round, short term, and summer programs. Once enrolled, we don't require appointments or pre-booking, you can drop off your child anytime we are open for instruction. Check our promotions tab for current offers. 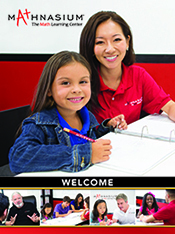 Start your child's math success journey now and call us to book an assessment. Register for our Summer Program before June 2nd and save 10%. Learn more about our summer programs here. My daughter has enjoyed coming to Mathnesium. The teachers and staff are very friendly, patient and take time to explain the concepts. I have noticed that my daughter performs better in math tests in school as well. My son loved the PI Day party! He said he never had so much fun with math. :-) Thank you all. Welcoming environment and our son enjoys going so... great job!!! Mathmasium has helped our daughter tremendously. She has gained confidence in math and is always wanting to play math games at home now. Thank you. I would just like to say, if it wasn't for the help that my son received from Aida and her team at Georgetown Mathnasium, I'm not sure that his final mark in math would have improved. They instilled confidence in my son, which he was lacking before attending his first tutoring lesson. I am very proud of my son for the great efforts that he and the team at mathnasium made this year, which resulted in a very good final grade in math. I would highly recommend the team at Georgetown Mathnasium. They have greatly improved my son's math skills. Mathnasium has been excellent at helping our daughter make significant progress in Math. They are experts in this area and our true partners with the student, home and school. Thank you! My daughter loves math now! She gets in front of class and teaches math strategies that she has learned. I love that they try to fill in all the individual’s gaps in knowledge about math. Wonderful place, my son gets great help, very professional and also very kind and caring. My daughter is gaining confidence and competence in math thanks to the Mathnasium of Georgetown team! Although it's early in the program for my child, she enjoys (in fact, looks forward to) going to Mathnasium. We are glad that she is happy attending the program and is motivated to learn. We are interested in getting a better assessment once she is back to school in September. Our daughter, Anna, who is going into gr 8 has been attending the summer program since the end of June. She wasn't thrilled at first to have to do math during the summer. Now, 4 weeks later, she's coming 4 times a week usually two hours each time. She is willing to go and sometimes stays longer (than 2 hrs!!!) to finish her chess match on game days. Overall it is a good program with well picked instructors to relate to all students. We will be continuing throughout the year to make sure she continues to build skills within a positive math environment. My boys who find math “boring” in school absolutely love attending mathnasium. The instructors/coaches are great with them. Playing the math games at the end of a lesson is the highlight and spinning the wheel to earn points. My boys are enjoying it so much that they are actually asking us to attend all the time! I NEVER would have thought that they would be asking us if they can go to do math.